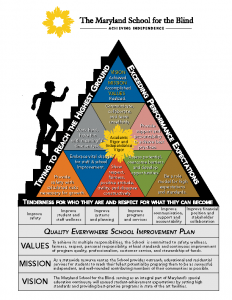 To achieve its multiple responsibilities, the School is committed to safety, wellness, fairness, respect, personal responsibility, ethical standards and continuous improvement of program quality, professionalism, customer service and stewardship of funds. As a statewide resource center, the School provides outreach, educational and residential services for students to reach their fullest potential by preparing them to be as successful, independent and well-rounded contributing members of their communities as possible. The Maryland School for the Blind, serving as an integral part of Maryland’s special education continuum, will exceed student-achievement expectations by setting high standards and providing best-practice programs in state of the art facilities.